The new Ecotech 3 Engine is making a huge splash with its efficiency and power. This new engine has made this year’s Wards list for top engines with ease. With reduced engine friction, improved valve timing, and better overall fuel economy this is an engine that’s going to still be amazing several years from now. Ward’s top 10 Engine list is one of the most prestigious lists of engines that exists. It is created by the magazine Ward’s Autoworld and was started in 1994. For an engine to make the list it must be featured in a car under $60,000 and the car must be out by the first quarter of the following year. So a car featured in the 2013 list can at best be a 2014 model that arrives before the end of the first quarter of 2014. The list takes into account the power, torque, noise, and many other features of the engine to bring the best engine list available to its readers. 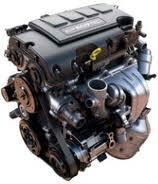 There are currently 3 different models of the Ecotech engine: a 4 cylinder, v6, and v8. The one ranking in is the V8 engine that is coming equipped to vehicles like the 2013 Cadillac ATS. All 3 ecotech engines feature fuel injection and have a high power, high torque system similar to that of a displacement engine. They are engines without equals in their field and aim to accomplish huge goals. The engine being in a car like the Cadillac that is long known for quality is almost evidence enough on its own for why it is such an amazing creation. Cadillac is one of the biggest names in comfort, style, and efficiency in the car world and the Cadillac ATS is certainly no let down to its name. With the Ecotech 3 making the top ten list for Ward’s it’s undoubted that it will likely make numerous other lists based on its quality and exceptional performance. It is rare that engines as good as the ones that make this list come along and the Ecotech is certainly one of the best and brightest on the list.